The leader of the British National Party has said he will not attend a Buckingham Palace garden party following uproar over his invitation. 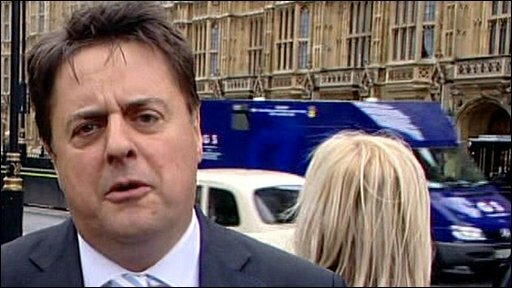 Nick Griffin said he had "no wish to embarrass the Queen" at the event. He had been invited to attend by Richard Barnbrook, a BNP member of the London Assembly, as his guest. Mr Barnbrook had been warned that his nomination to attend the event would be reviewed if he did not change his choice of companion. Like all the other members of the London Assembly, Mr Barnbrook is in line for two tickets to the party on 21 July. Speaking outside the Houses of Parliament in London, Mr Griffin said his party could have earned a "great deal of publicity" by attending but did not want to embarrass the monarch. He said the reaction to his prospective presence at the party had been "hysterical". He added: "We believe it is still outrageous that a democratically-elected member of the London Assembly can't invite who he likes as a guest to the party at the Palace. "Nevertheless, because we have no wish to embarrass the Queen and allow the liberal left to do more damage to our institutions, I've withdrawn from the idea of going myself." Mr Barnbrook said he would still attend the party, but would take with him the mother of a soldier killed in Afghanistan. London Mayor Boris Johnson, who had previously called for Mr Griffin to withdraw, welcomed the decision. He said: "I am glad that the BNP leader has recognised that his presence at Buckingham Palace would have been a political stunt, which could have embarrassed Her Majesty." A spokesman for the anti-fascist group Searchlight said it was pleased that "the gates of Buckingham Palace have been closed" to Mr Griffin. GLA deputy chief executive Jeff Jacobs had written to Mr Barnbrook warning him to change his controversial guest or face having his nomination for the event "reviewed". He also asked Mr Barnbrook to stop exploiting the situation for "publicity". The BNP is accused by its opponents of stirring up racial hatred. The party says it is standing up for Britain's "indigenous population". It campaigns for the "voluntary resettlement" of non-white British citizens to their country of ethnic origin and preferential treatment in the jobs market for British workers.